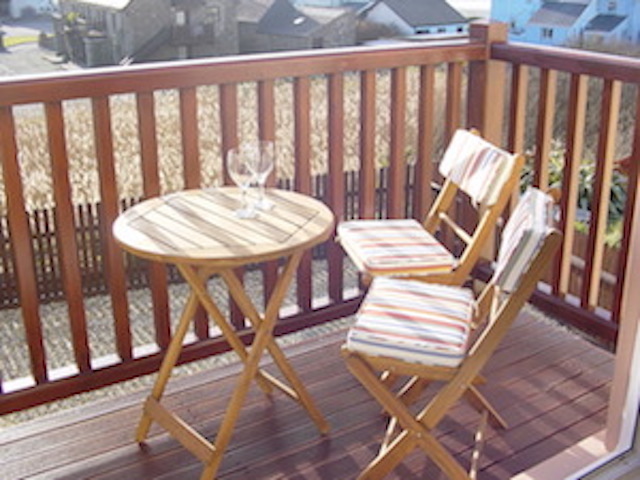 Wonderful, 3-storey, 5 star, self catering holiday accommodation in Broad Haven, Pembrokeshire, which is extremely well equipped. It is situated two minutes walk from Broad Haven's beautiful beach, shops and restaurants. Ideal walking area, convenient for the National Parks coastal footpath and for visiting both North and South of the county and the many attractions on offer. Ground floor Bathroom: Bath with electric shower, w/c, sink, mirror, wall mounted fan heater, extractor fan and shaving point. Ground Floor Lounge: With sofa, reclining armchair, coffee table, TV with freeview and patio doors leading to rear garden. First Floor Lounge: sofa, armchair, TV/DVD with freeview, CD, and selection of DVD's, CD's, Books and games. French windows leading to balcony with sea views over St Brides Bay and islands. Kitchen/Diner: Fully equipped, built in fridge/freezer, washing machine, dishwasher, ceramic hob, oven and microwave. Open plan, with lounge; lends itself to sociable entertaining. 2nd Floor MasterBedroom/En-Suite: Double bed, duvet, pillows, TV with freeview, leading to en-suite shower room, with toilet, mirror, shaving point. Garden: Enclosed with access via patio doors in ground floor lounge. Parking: Parking for up to 2 cars is available to the front of the property. Bed linen, jay cloth, scourer, tea towel and bath/hand towels provided. If second week booked, fresh bed linen and towels can be made available. Heating is supplied via economy 7 storage heaters. Please note that there will be a £15 per week heating charge during the months of October to March inclusive. We enjoyed our stay at 'The Havens'. The accommodation was great. Everything we needed for our short stay. The dishwasher, freezer and washing machine would have been useful for a longer stay. The view of the sea from the lounge area was quite something. The location was excellent for the coastal path and the bus service provided options. The local shop was larger and more supplied than we expected. Also, the longer opening hours was an advantage. There were a few good choices for eating out in Broad Haven and Little Haven. Overall we had a good time and hope to return in the future. Ty Mor is easily the best holiday accommodation we have stayed in and we were really sad to leave. It is spacious, immaculately clean, well equipped with spectacular views over the beach. We really felt at home. Broad Haven is such a lovely, ideal location to stay in. We visited lots of places nearby but loved the fact we were just two minutes from the beach. We will definitely be returning. We loved our stay at Ty Mor. It has wonderful sea views and is perfectly located for easy access to the beach and amenities. Ty Mor itself is very comfortable and well equipped. All in all the perfect holiday Base. Thank you for having us we had a great stay. The house was very spacious as well as very clean and tidy. The kitchen and living areas were lovely and had all the amenities we could possibly need. One of the showers didn't work however Karen and her team were very quiet to respond and fix the issue. The views we gorgeous and we would happily book again. Thank again! Really enjoyed our stay at Ty Mor, the place is like a home from home with all the convenience we needed. Located only a stones throw from Broad Haven beach made this an ideal base to explore Pembrokeshire. As usual, we had some good weather and had great time windsurfing, kayaking and walking the stunning coastal paths. Looking forward to coming back. Thanks again, we had a great time and the house was lovely and we look forward to coming back again soon. It was lovely stay in a well maintained, clean, tidy, spacious property, with marvelous views out of the french and upper floor windows. Very accommodating owner. We will be coming back. We had a lovely time at Ty Mor - thank you for the welcoming Welshcakes, milk and juice. The house is a real home from home. It has everything you could want in a holiday home and more. It's clean, tidy and very cosy on the one day the weather defeated us and we stayed in to watch a DVD - there is plenty to choose from. With the beach being just a minute away, it's a perfect place for a beach holiday, but also within easy reach of many other attractions. We enjoyed visiting the Botanical Gardens and Fishguard. I would definitely recommend Ty Mor. Ty Mor, is a gorgeous 3 storey holiday home, clean, welcoming and comfortable. It is located a stones throw away from the beach front, cafe and restaurant, and is perfect as a base from which to explore West Wales. We often chose to stay in during the evenings, playing board games, watching the sunset from the balcony, and having family down time, since it was so homely. My daughter and I even baked biscuits! A super holiday, thank you, Karen. We had a great stay at Ty Mor. Great accommodation with everything you need in a fantastic location! So near to everything, easier to nip home with the kids for the toilet then walk to public toilets (which are not far away). Definitely hope to stay again soon. Thanks once again to the team at StayInTheHavens absolute lovely property spotlessly clean, and the kitchen was well stocked. Great location for kids with beach and nearby restaurants. I will be booking with you again next year! We thoroughly enjoyed our stay at Ty Mor and would have no hesitation in recommending the property. We had a great stay at Ty Mor. It's a great place which is well equipped and great location for all the amenities. We hope to be back there again sometime. Thank you! We all loved this place, suited us perfectly. Lovely views and so well equipped. Can't wait to return. If you need wifi its free at the Ocean Cafe. A special thank you to Karen Griffiths. Lovely weekend, we love coming to Broad Haven adn have stayed in a few different properties over the years. Lovely house and views, weather was good, loved the sunsets and coastal walks. Always take a drive to Solva. Will be back. Definitely recommend. Fantastic house, lovely views. Great coastal walks. Seen seals with pups. St Davids worth a visit. We must have had the sunniest week. Feel very lucky. Can't wait to come back. Give paddle boarding a go! What a beautiful house with beautiful views, can't wait to come back again next year!! Another lovely week in Broad Haven. Weather super and accommodation everything we expected with the highest standards. Hope to be back next year. Many thanks - your efforts are appreciated. Well presented home wiht everything we needed, looked forward to waking up to the great views in the morning. We really enjoyed our stay adn look forward to returning. Many thanks. Lovely house, great views. Lovely day at Druidston Haven and seal watching at Martins Haven (lots of pups on the rocks). Thanks for a lovely break. Ty Mor is an comfortable and well set up holiday house. The first floor open plan area, with the balcony overlooking the sea, is particularly attractive. The bedrooms have good quality beds and linen, and are light and airy. The garden has space for eating out and for children's play. Broad Haven itself has a fantastic beach and the village store is well enough stocked to make seeking out supermarkets unnecessary. The coastline around here is stunning. We had a great holiday here.